You should maybe delete that because you clearly know exactly what the hell you are doing: Writing great stuff about music you know and love. Maybe more commentary on your personal connection to the music will come with later albums. There are old clips online of Joni performing from this time period (and earlier, I think, on a local Canadian station). Are you going to include and comment on those? 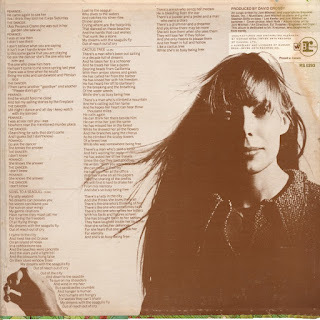 Into this newly re-ploughed field has stepped Joni Mitchell, composer, singer, guitarist, painter, and poetess from Alberta, Canada. Just who — and what — is Joni Mitchell, this girl who's so obviously perched on the verge? To those who don't spend hours in audio labs studying the shades, tones, and nuances of the human voice, Miss Mitchell is just a singer who sounds like Joan Baez or Judy Collins. She has that fluttery but controlled kind of soprano, the kind that can slide effortlessly from the middle register to piercing highs in mid-word. Like Baez, Miss Mitchell plays a fluid acoustic guitar; like Collins, she can switch to the piano once in a while. And her compositions reflect the influences of Cohen. On stage, however, she is her own woman. 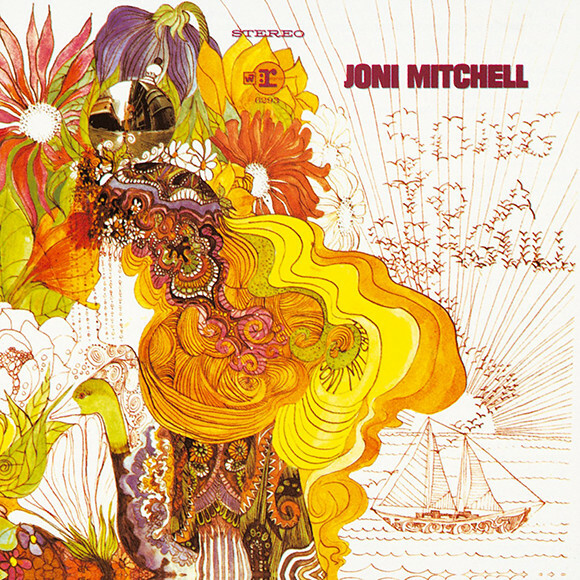 Where Joan Baez is the embattled but still charming Joan of Arc of the non-violence crusade, and where Judy Collins is the regal, long-time lady-in-waiting of the folk-pop world, Joni Mitchell is a fresh, incredibly beautiful innocent/experienced girl/woman. We were talking about that idea of holding back some of your best songs for a second (and maybe third) album. Don't you run the risk that the first album will tank and there won't be a second album? Maybe only people with a sizeable pile of good songs did that. If someone had only two or three good songs, they (and the label) probably wanted them all on the debut. I wasn't planning on writing about performances or biography or anything else but the albums, and as you say, my personal connection to the music. But things have a way of growing. About the first-album question, I have something from the book to share. Next comment.